Previous post: Watch out for that man with the enormous ax! 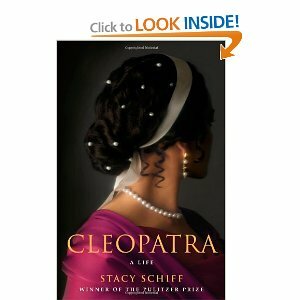 So my book club read Stacy Schiff’s Cleopatra last month. …her story is constructed as much of male fear as fantasy. Strewn in heaps over the floors, they lent the impression of a country meadow, if one littered at meal’s end by oyster shells, lobster claws, and peach pits. They inherited equally and held property independently. Married women did not submit to their husbands’ control. They enjoyed the right to divorce and to be supported after a divorce. Until the time an ex-wife’s dowry was returned, she was entitled to be lodged in the house of her choice. Her property remained hers, it was not to be squandered by a wastrel husband. The law sided with the wife and children if a husband acted against their interests…They loaned money and operated barges. They served as priests in the native temples. The initiated lawsuits and hired flute players. As wives, widows, or divorcees, they owned vineyards, wineries, papyrus marshes, ships, perfume businesses, milling equipment, slaves, homes, camels. As much as one third of Ptolemaic Egypt may have been in female hands. Considering that Schiff is writing about Egypt circa 55 BC (yes, BC) that’s a bit of an eye-opener. Intelligent and extensively educated, Cleopatra spoke seven languages, and was the only Ptolemy ever to learn Egyptian, the native tongue of most of her subjects. She was smart enough to embrace the role of Isis in all public ceremonies and annual celebrations, becoming not only queen but goddess. This made her so popular that in the twenty-two years she reigned, she never faced a rebellion, the only Ptolemy of whom that can be said. [Octavian] celebrates [Cleopatra’s] defeat before it has occurred. Virgil and Propertius were on hand for the Egyptian triumph, by which time both the asp [according to Schiff, it wasn’t an asp, it was very probably poison made by Cleopatra’s own hand] and Cleopatra’s pernicious influence were already set in stone. In every reckoning Antony is made to flee Actium on Cleopatra’s account. She helpfully illuminated one of Propertius’s favorite points: a man in love is a helpless man, shamefully subservient to his mistress. It is as if Octavian delivers Rome from that ill as well. He has restored the natural order of things: men ruled women, and Rome ruled the world. On both counts, Cleopatra was crucial to the story. Not to mention which, the treasure Octavian looted from Egypt paid his way to power in Rome. Since this is my blog and I get to write what I want, I think Cleopatra was always a queen first and a lover second. Caesar became her lover by default. He was the man on the ground, the representative of the Roman Empire who was going to decide who reigned in Egypt, Cleopatra or her brother. She had no choice, she had to seduce Caesar over to her side, and she did, and that plus a little matter of fratricide put her on her throne and kept her there for twenty-two years. She got a very good deal right, and one crucial thing wrong. That one crucial thing was, of course, Marc Antony. But, again, what choice did Cleopatra really have? Octavian, Lepidus and Antony carved up the Roman world between them and Antony got the eastern Mediterranean, which included Egypt. Again, Antony was the Roman on the ground, the guy with the legions. She invited him to Alexandria and she seduced him into supporting her, but when he left she didn’t see him again for three years. Schiff doesn’t report any credible evidence that Cleopatra pined for him, she got on with the business of ruling her country. Nor did he pine for her, he married Octavian’s sister and they lived together in Athens in what sounds like amity and affection. It isn’t until he returns from Parthia, a beaten man, that passion seems to overcome all else and he turns into an octopus, holding on to Cleopatra with all eight arms. By then Antony needed Cleopatra a lot more than she needed him and she knew it, but again, what was she going to do? She had deliberately seduced him to keep her throne and her country, and he was still the man in charge of her part of the world. Her distress at his death, all that weeping and wailing and tearing of hair and breast, that wasn’t grief, that was part show, for the watching Roman soldiers in hopes that it would sway Octavian to let her keep her throne, but mostly rage, against the doofus who let her and Egypt down. She had to know by then that this was not only the end of her but the end of her country as anything but a client state of Rome. I’d have been pissed, too. One of the fun things about a book like this is indulging in “what if.” When everyone and his brother was deserting Antony (deservedly so, what a wretched general, this was a guy who had only one good battle in him), what if Cleopatra had deserted, too, what if she had reached out to Octavian? She was in Rome on the Ides of March when Caesar was assassinated in the Forum, she was there when his will was read. He left Antony nothing. He chose Octavian as his heir. Caesar obviously knew both men well, and wrote his will accordingly. What if she had taken her cue from him? And the latest news in the life of Cleopatra? David Fincher is making a film based on this book starring Angelina Jolie. This woman just won’t die. One last note: I wanted to give a shout-out to the cover art. It’s rich in color, opalescent even, reminiscent of Cleopatra’s lush life in Alexandria, but what I love is that her face is turned away from us, her features obscured in shadow. We can never truly know her. But Schiff sure gives it the red-shift limit try. Just for fun, here’s the trailer to the Elizabeth Taylor version of Cleopatra.